Since we have alot of new readers from all of our Savings Nation coupon classes and many who have recently found Thrifty NW Mom, we are going to start going back to the basics of couponing, including sharing tutorials for the different stores we provide matchups for on TNWM. For those of you who are new to shopping at Albertsons with coupons or if you just need a refresher on using coupons and taking advantage of the promotions at Albertsons, here is a tutorial on how to shop with coupons at Albertsons. You can always find the most recent Albertsons coupon matchups and store deals under our Albertsons store category, too. Albertsons new store deals start every Wednesday and run through the following Tuesday. You should receive an Albertsons ad in your mail on Tuesdays; if not, pick up a store ad / flyer in the store starting on Wednesdays. You’ll want to first make sure that you’re signed up for the Albertsons store loyalty card, called the Albertsons Preferred Savings Card. You will need to use your Albertsons Preferred Savings Card (or enter the phone number for your account) every time you go thru checkout, to make sure you receive all the sales and discounts available in the store. You can find the Albertson’s Coupon Policy online – I recommend printing off a copy & keeping it in your coupon binder or coupon files in case you need to refer to it at the store. No more than 3 transactions can be completed at a time in line. They do not accept internet generated manufacturer coupons for a free product without a required purchase or coupons with a redemption value greater than $5. An Albertsons Buy One, Get One Free store sale can be combined with a Buy One, Get One Free manufacturer coupon to make both items FREE. Coupons that exceed the retail value of an item will have the remaining amount applied to the balance of the transaction. Basically, this means that you can receive overage if your coupons exceed the value of an item; however, they will not provide cash-back – you will need to add items to your order to absorb the overage. 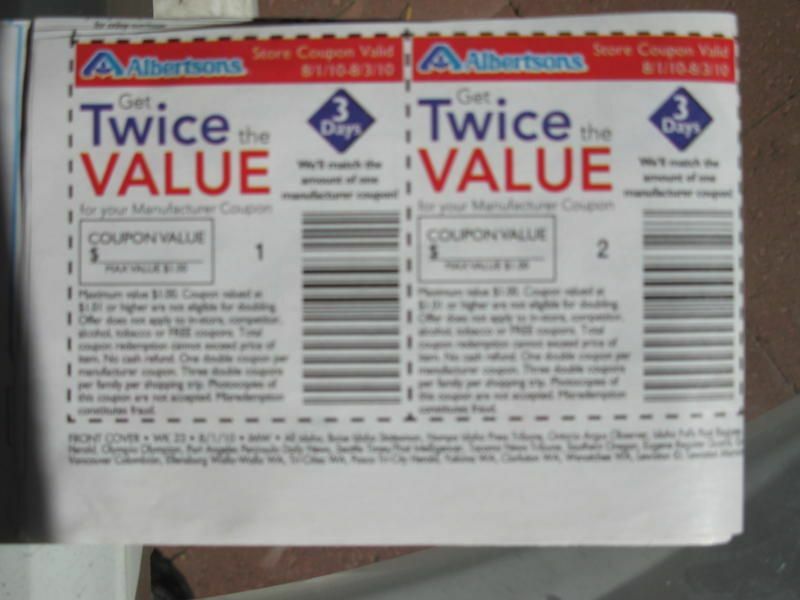 Albertsons does not allow a store coupon to be used with an Albertsons Twice the Value coupons – you can only use a manufacturer’s coupon valued at $1 or less with a doubler coupon. Albertsons does allow you to use manufacturer’s coupons which state cannot be doubled to be combined with a Twice the Value coupon. Every few weeks, Albertsons will offer Twice the Value coupons, which we call “Double Coupons”. This does not happen on a set schedule, but when they do release the doublers, they come in the Sunday paper only (via a one page Albertsons flyer) and are valid from Sunday – Tuesday (with a few rare exceptions around holidays). Every few months, Albertsons offers a special promotion called their “Coupon Round-Up Event”. This is where they will automatically round up manufacturer’s coupons to $1 at the register. You do not need any special coupon to take advantage of this promotion – the register will just automatically round up all coupons up to $1. 1. Any coupons from $.25 – $.99 will be rounded up to $1. For example, a coupon for $.50 off a box of General Mills cereal will be rounded up to $1 off a box of General Mills cereal. Same with a coupon for $.75/1 – will be rounded up to $1/1. 2. If a coupon is $.24 & under, they will be quadrupled. This will happen automatically when you use your coupons under $1 at the register. For example, a coupon for $.20 off Campbell’s soup will be rounded up to $.80 off Campbell’s soup. 3. No overage will be given with the rounding-up event – if the rounded up amount is over the amount of the item, then it will be free. 4. Coupons valued at $1 or more will be redeemed at face value. Make sure to check out Albertson’s Preferred Reward Program, where you can earn points for your purchases as well as bonus point promotions. When you reach 5,000 bonus points, you will then earn a $5 Rewards certificate, which will print on the bottom of your receipt to be used on a future transaction. Read more details about the Preferred Reward Program for Albertsons. Sign up to receive Albertsons emails and you will be sent a $4 off coupon to be used on your purchase of $25 or more. You can also earn up to 5 additional $4 off coupons when you refer friends to sign up for the Albertsons Email Savings Program. You will also receive emails with coupons, discounts and more for Albertsons stores. Bonus – Get over $8.00 in web-exclusive savings at Albertsons.com/greatdeals. I heard a rumor from my Albertsons cashier that we will soon be able to do as many transactions in a row as we would like with the Twice the Value. We can still only use three per transaction, but we can do four, five or even six in a row if we would like. She didn’t have a start date, but said soon.